Film buffs, children of the ‘80s, or anyone who has a penchant for John Hughes’ films often wish they could have been a part of creating one of his classic films, whether as an actor reciting iconic lines, a composer writing the perfect music for the soundtrack, or as a director calling the shots from behind the camera. 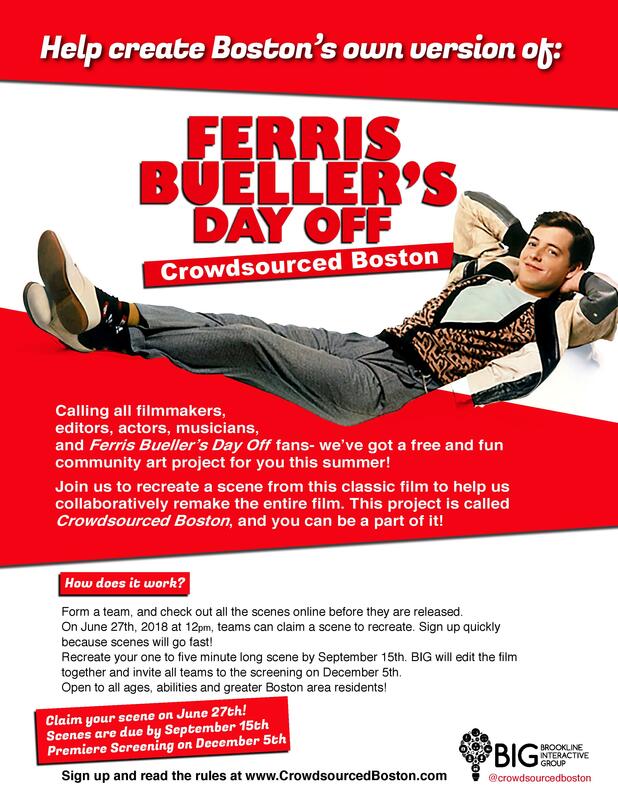 For many, this is just a dream, but that is exactly the opportunity that Crowdsourced Boston, a collaborative community arts project in its second year, is offering the greater Boston area this summer as it takes on recreating Ferris Bueller’s Day Off as a crowdsourcing project. Crowdsourced Boston is an offshoot of Crowdsourced Cinema, a public art project created by Northampton Community Television (NCTV). Each year, Crowdsourced Cinema recruits about 40 filmmaking teams in their community to collaboratively remake a famous film. Their inaugural remake was of the classic Raiders of the Lost Ark, followed by The Princess Bride in 2016, and Back to the Future in 2017. Last year, with Northampton’s encouragement and help from several community media centers and teams from the greater Boston area, Brookline Interactive Group, a community media center in Brookline, MA, spearheaded an offshoot project called Crowdsourced Boston and created a separate, full-length crowdsourced version of Back to the Future. Each team who signs up for this project gets a scene from the film to interpret creatively in their own manner - last year teams used live action, animation, remix, puppetry, silent film, and other visual styles. The only rules are that teams must follow the same action, dialogue, and total running time of their short scene without using copyrighted images or audio. A team could be made up of a family, co-workers, actors, friends, classmates, or any group who wants to create a one-to-four minute scene of this year’s project, the ‘80s classic, Ferris Bueller’s Day Off. The final film is then stitched together by BIG and will premiere at the Coolidge Corner Theatre on December 5th, and will then be distributed on the web. BMC is hosting a class for kids in grades K-4 to create a scene for the movie! If you are interested in learning more and signing your kid up for this week-long program, head to our Classes Page. We also welcome teams and individuals of all ages from Belmont who are interested in getting involved! Contact Jane Peters to learn more about how you can use BMC's equipment to create your scene, or how to join or create a team! Teams can preview all the available scenes NOW, and will then be able to sign up for a specific scene starting at 12:00 pm on Wednesday, June 27th. The scenes will be alloted to teams on a first-come, first-serve basis. The recreated scenes must contain the same dialogue and action and be the same length as the original. Completed scenes are due on September 15th. Crowdsourced Boston invites the Boston regional community to form teams and to recreate a scene from this classic film, and then sign up for a specific scene at: www.crowdsourcedboston.com.